Today we will preview weather conditions for the 142nd Kentucky Derby that may affect the outcome along with our projections for 2016 Kentucky Derby online betting. Unlike baseball games, horse races don’t get rained out. Unless a dangerous weather condition exists, such as thunderstorms, most horse races go off regardless of the prevailing weather conditions. That means that horses and jockeys need to be ready to deal with anything, and race bettors need to understand how the conditions will affect the performance of the field. Generally speaking, a race will slow down when the track gets wet. In that case, slower horses may have a better chance to keep up. 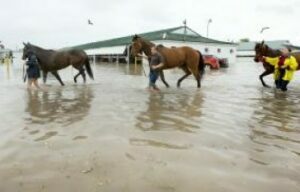 In perfect conditions, the faster horses will have an obvious advantage, but that advantage is somewhat negated when the conditions get sloppy. The pack will usually come together in bad weather, meaning that there is more room for upsets and wild finishes in the mud. It is never easy to handicap a horse race accurately, but it might even be more difficult when the conditions take a turn for the worse. If you are a horse racing fan who enjoys wagering on the races from time to time, make sure you check the weather conditions as part of your usual preparation for a race. The last thing you want to do is place a wager on a horse that is great in dry conditions, only to find out that it is pouring down rain at the track. When you do notice that wet conditions are in place, research the field to find out if any of the participating horses have a track record of running well in the slop. Every edge you can find is useful when wagering on horses, and poor track conditions just might be an indication that a longshot is about to land a victory.